When this client first came to us they were looking to upgrade their weekend lake house to reflect the finishes and functionality they were accustomed to in their primary residence. As the project developed it was clear this would be their retirement home therefore bringing an added level of importance to the remodel. Though this was a whole house remodel project for our team, our focus was on the master suite. Overall, the existing home could be described as a builder grade Tuscan-style. By the completion of the project our team would adhere the to that genre, but with a modern, yet stylish flair to suite the clients’ aesthetic and functional desires. 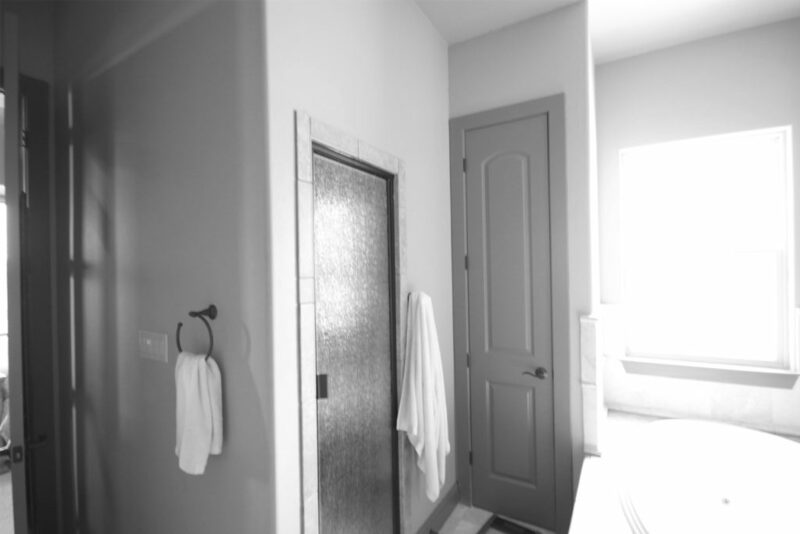 While decent in size, the existing master bath seemed cramped and dim due to an oversized, windowless steam shower and large tub deck that created a narrow walkway between the shower entrance and linen closet. Similarly, the vanity held nothing to be desired. 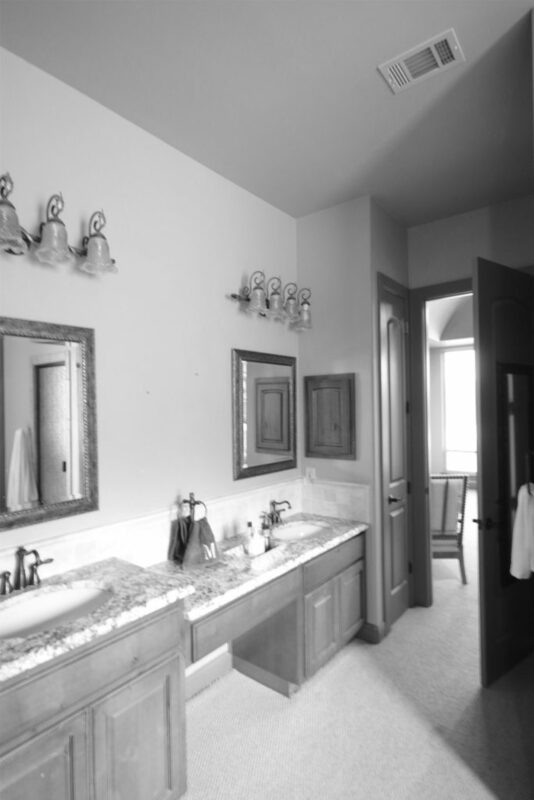 The client was seeking a spa-type shower and bathing experience, separate vanities with elegant finishes, and more natural light of which the existing layout was not taking advantage. The homeowner also requested a more interesting ceiling detail; one that matched that of the adjacent master bedroom. Finally, the wife specifically desired a “boutique-like” master closet with plenty of adjustable and specific storage. Having seen some of our previous bathroom and closet details, the clients were looking for that “wow” factor and left the details up to us. What our trifecta design+build team was able to accomplish went above and beyond their expectations. The resulting bathroom, that utilizes the same footprint as the original, leaves one wondering where the spaciousness was found. 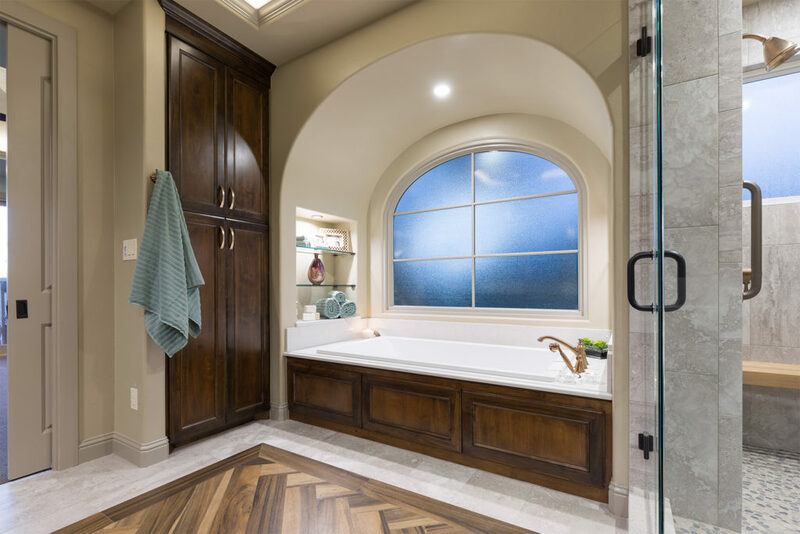 The jetted “Underscore” tub by Kohler is framed by an elliptical arch niche that is mimicked in the custom designed Marvin window creating a soaking oasis. The new frameless glass walk-in shower with pebble flooring, arabesque wall tile accents, and brushed bronze fixtures by Brizo are a liberating contrast to the old cavernous steam shower. Tasteful grab bars endorse universal design elements, while a handheld shower head and custom teak bench allow the user to relax while washing the stresses of the day away. Taking center stage is the 72” square porcelain tile inlay. Laid in a herringbone pattern, the tile planks replicate the look and texture of real acacia wood bringing forth a grounding, organic element to the design. Furthermore, this feature purposely reflects the new groin vault ceiling directly above, boasting perimeter LED cove lighting that provides the perfect ambiance for soft indirect lighting one would find in their spa experience. The groin vault was created by dropping the poorly scaled 10’ ceiling to 9’ high, giving us 12” of space to fit the vault and light cove under the floor trusses above. Benjamin Moore Modern Masters metallic paint was troweled over an ethereal blue base color producing an iridescent finish which reflects the cove lighting along the vault and evokes a sense of serenity and loftiness – a delightful sight as one lounges in the jetted tub. London Gray Caesarstone countertops “ice” the top of the richly stained alder wood custom vanities that provide ample storage for toiletries or grooming appliances while granting a perfectly apportioned area to display decorative accents and family pictures. The elliptical shape is repeated in the vanity arches and mirrors, which “float” off the wall in order to provide a reveal for LED task lighting. The back-lighting technique offsets the typical shadows that occur from overhead down-lights and provides a more even lighting affect. In their previous home, the couple each had their own closet, so trying to accommodate for both of their belongings in one space utilizing the existing closet footprint would prove to be a challenge overcome in the design phase. The client also desired “detailed and specific” storage solutions such as jewelry and scarf storage, lingerie storage, and hat and purse hooks. She also requested a vanity mirror, a dressing bench, and, finally, lots of lighting to adequately illuminate the closet contents. First, the contents of both individual’s closets were notated detailing the exact numbers of each kind of item. Exact lengths of their existing hanging storage needs were measured and accounted for. Then a basic layout was made to accommodate for every kind of storage solution from clothes rods, to shoe cubbies and shelf storage, followed by detailed construction drawings and notations. Fortunately, the existing closet had ample vertical space, so taking advantage of the 10′ ceiling was paramount in the design of the new layout. By designing tall cabinet boxes with specifically located custom rod holders, we were able to achieve 3 sections of adjustable rod space for all the different garment lengths. A “tall boy” vanity was designed to hold lingerie storage, custom-designed velvet jewelry drawer inserts by October Company, and flanking necklace and scarf pull-outs. With the homeowner’s body measurement’s in mind (and previously used in the layout of the bathroom details), a dressing bench and hat hooks were located just above one of Rev-A-Shelf’s chrome pull-out hampers. Generous “seasonal” storage space is located at the ceiling by way of hanging rods or adjustable shelving. Access to the high areas can be achieved with the help of either an extendable clothes hook or a ladder hung on the wall nearby. To illuminate the space properly, we replaced the existing fluorescent tube lighting with LED recessed can fixtures. We also installed matching 3000 degree Kelvin LED tape light behind the stiles of the cabinet boxes. This creates a luxurious “boutique” feel and reflects the clothing’s truest colors. In order to attain a cohesive connection to the new master suite we used the same burnished bronze cabinetry hardware and the same cashmere colored nylon carpet. The shiny, tight looped fibers in the carpet and the unusual amber color of the hardware gives the closet a lavish appearance. The custom cabinetry is painted in a crisp “Pediment” white to slightly contrast with the soft neutral gray wall color. The light paint colors combined with multiple layers of ample lighting gives the small space a clean, bright, lofty feeling. Overall obstacles overcome in this remodel included reconfiguring the bathroom ceiling to implement a groin vault with second floor framing above and rerouting drain vents through the reconfigured ceiling to allow their penetration through the second floor framing above in their original locations. 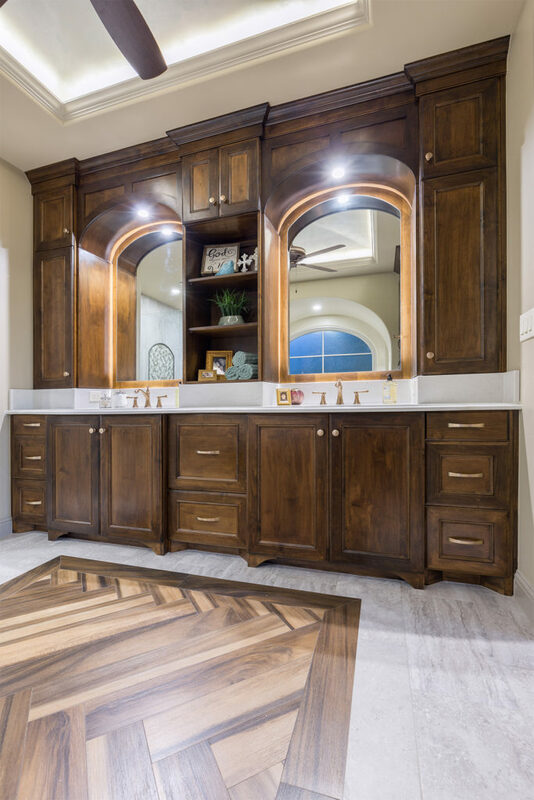 Painstaking attention to detail and innovative thinking are displayed in the construction of the elliptical framed cabinetry over the mirrors which match the adjacent tub niche and groin vault in the ceiling. The clean transitions were especially difficult to achieve as stained cabinetry is more unforgiving than a painted substrate. Had paint grade cabinets been specified the options for creating the curves could have been mastered with mediums such as “bondo”, but with stain grade wood, our team had to be much more accurate and meticulous. Thus, a shaped substrate was made onto which very thin veneers were applied that would accept the tight radius that the ellipse required. In the end, the clients were amazed and overjoyed with the transformation and caliber of craftsmanship. Every detail, from the layers of lighting and exquisite architectural details that maintain the original Tuscan feel, to the updated, easy maintenance and slip-resistant materials and finishes, all were carefully considered and integrated into a space the clients can relax in and enjoy for years to come.